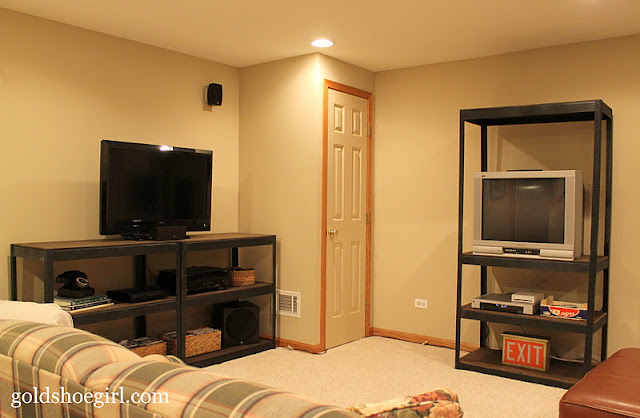 In my last post I shared the before & after pictures of our basement media area. This project came about because I wanted a cheap and easy but good looking media solution. I thought the industrial style was perfect down in our "mancave" but all I could find were either expensive (as in $2500 at Restoration Hardware) pre-made options or diy versions that required going to a welder. Neither idea appealed to me at all. 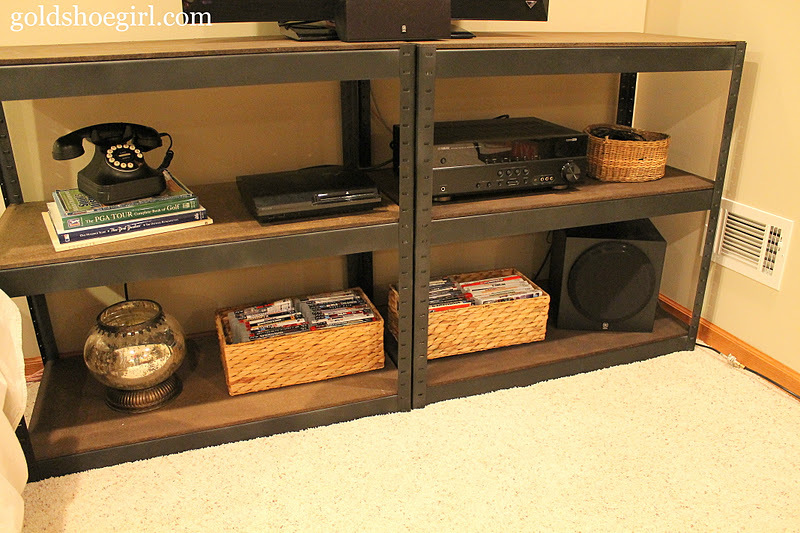 Instead I re-purposed a couple of sets of steel shelving that I found at our local home improvement store. The entire project cost about $120 and can be completed in a couple of hours over a couple of days. Step One: Decide on approximate size of desired media center. You'll want to do a rough measurement of the area where you wish to place the finished unit. I say rough because you are going to need to work with the prefabricated pieces of the shelving unit. At our store you could choose from a number of different widths (36" to 60") and depths (16" to 24") and heights (60" and 72"). We choose to go with 2 packages that were 72" x 48" x 24". 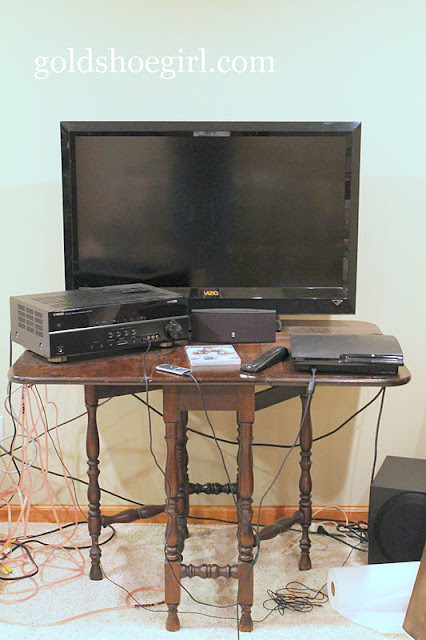 The 24" depth was needed to fit the cable box and the surround sound receiver box. Each package came with 5 shelves. In our design we used the combined pieces of 2 sets to build one side by side unit and one taller unit. Click here to see the options available at our local Menards. I'm sure most any home improvement store has similar options. 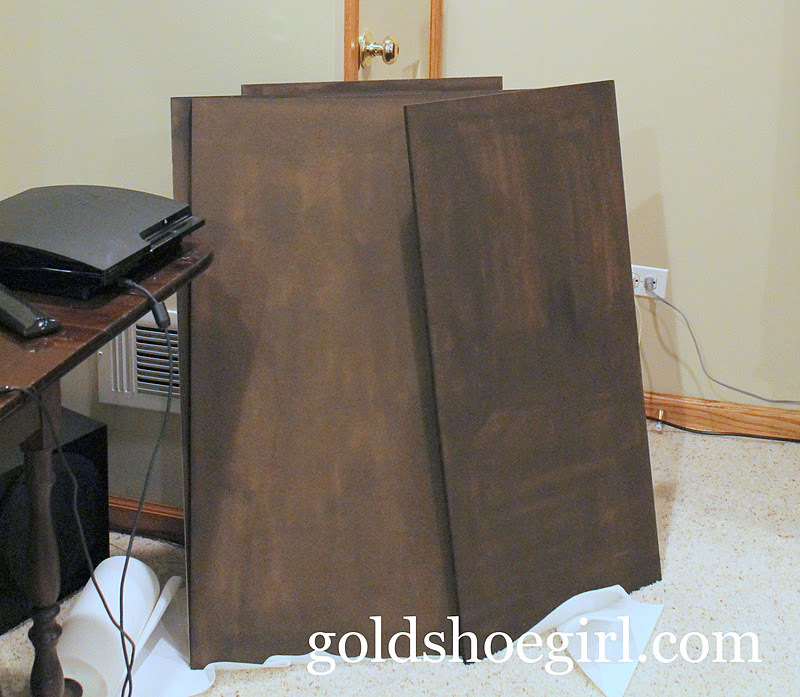 Step Two: Spray Paint the steel pieces. The pieces in our box were originally a light gray that screamed garage shelving unit. We painted them to give the aged look we wanted. 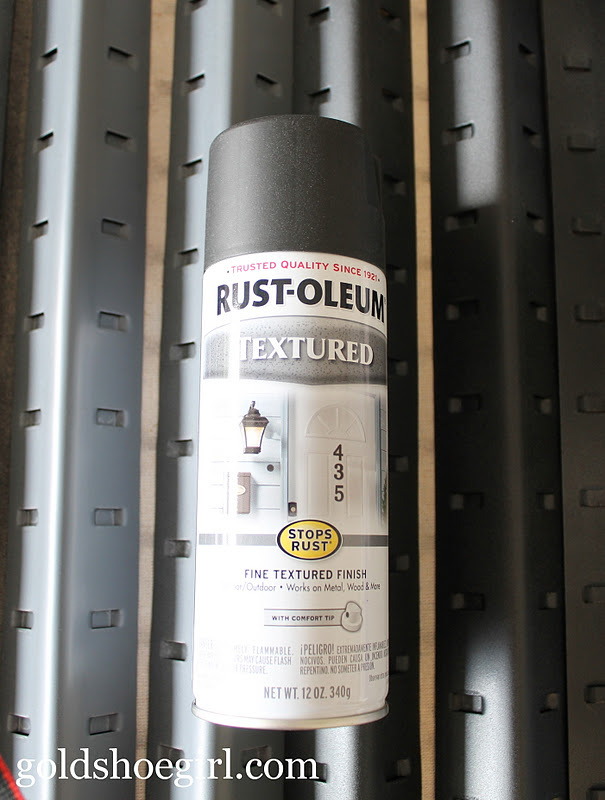 We used Rust-Oleum Fine Textured Black spray paint. This gives the closest match to the Pottery Barn and Restoration Hardware versions. I tried the Hammered version of the spray paint but the finish is too shiny. The finish on these needs to be more flat. You want to spray both sides of all the pieces because all the sides show once built. It took a little less than 1 can per set of shelves. You can see in this picture the slots for where the front and back pieces attach. Once these are painted and put together you don't notice the slots at all. Step Three: Stain the wood shelves. Now these shelves are made of some kind of particle board. They are thin but they drink that stain like no tomorrow. We went through an entire can of Minwax special dark stain. The entire can. Gone. I suppose you could paint the boards but I don't think it will give you as authentic a look as the stain. Now the stain does not go on perfectly because there really is no wood grain but that's okay because you really just want coverage. Once you put all your equipment and accessories on the shelves you don't notice the imperfections at all. Also, make sure to stain the edges because they show. Better to do this in the garage when you are doing the top and the bottom than wait until they are in your basement and all assembled and then you have to be really careful and make sure you don't spill stain on the carpet. Just sayin'. Also, if you plan your design out ahead you can save yourself a little work by not staining the bottom side of the shelves that go on the bottom as those don't show. Step Four: Build your unit. This is where you build according to your design plan. 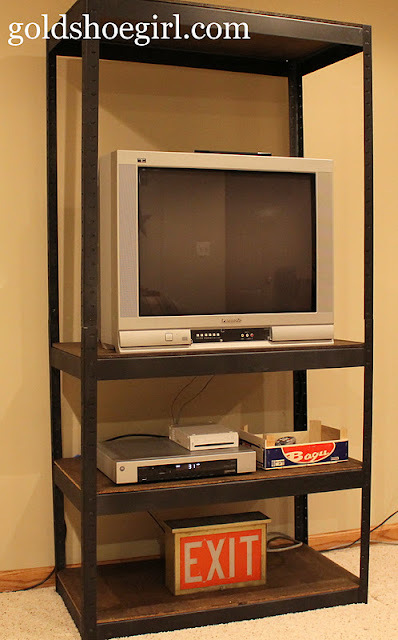 Our particular set of shelves were nice in that it allowed for either a side by side or tall unit and while the top and bottom shelves were fixed the rest were adjustable. You can see in the picture below that our wide unit is two units set next to each other. They are not attached together at all but by putting the tv in the middle on top it appears to be one cohesive unit. You can see that each side of this unit used 3 shelves (top, middle, bottom). Each package only provided 5 shelves so we used the parts from the second package to complete this unit. I also wanted to mention that these are super strong. I think the package said each shelf can hold 2200 pounds or something crazy like that. I should mention that if you use this for your media equipment you are going to have to play around with the cord and wire situation. Because the back of this media unit is open all the numerous cords and speaker wires and such show. I ended up spending a good hour or more moving equipment around and taping wires & cords to the back of the cross pieces so they would not show. 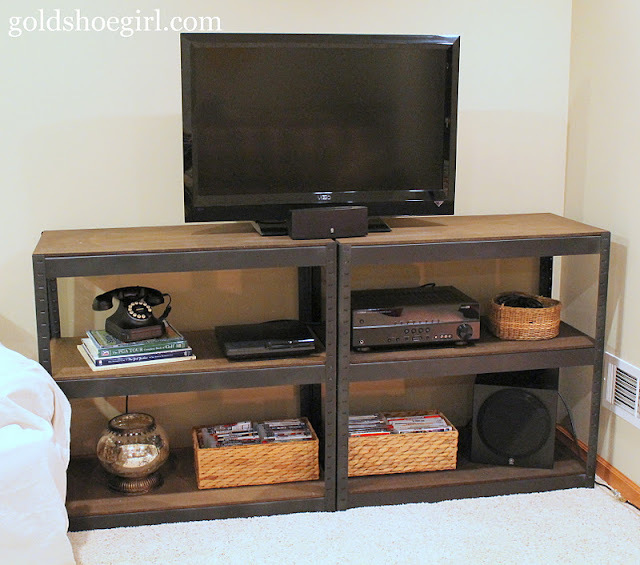 It's something you may want to keep in mind when deciding on this style for a media center. This home, unlike our previous one, has a finished basement. Between the bar and the sound system it pretty much sold the house to my husband. We set up all the video game stuff, movie stuff and music stuff down there upon moving in. However, it wasn't pretty. It functioned but it was definitely lacking in style. I think the pictures speak for themselves. 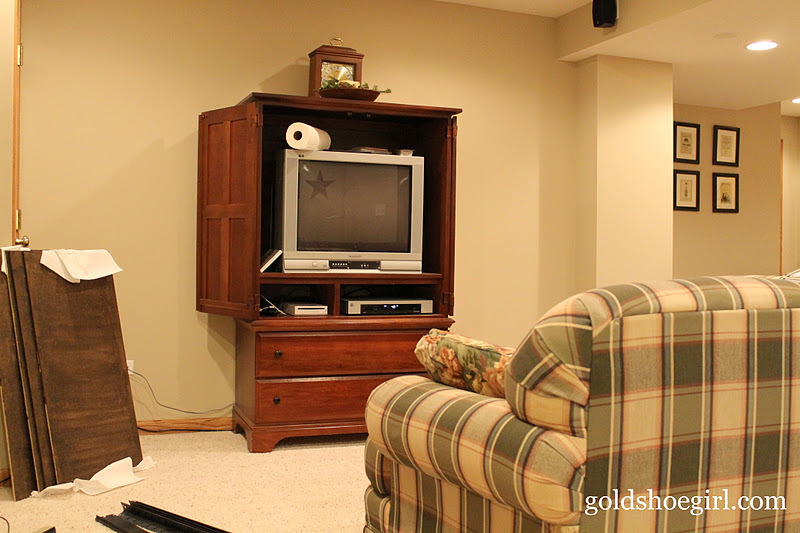 Excuse the photos - there's no natural light in this part of the basement so getting good pictures is tricky. Anyways this is the tv that you use for playing playstation games. We just stuck it and the surround sound system on this antique table. Gotta love all those ridiculous cords and wires. Here's the other tv. You use this tv for actually watching tv and playing Wii. This setup allows both my husband and the kids to be playing video games together or for one person to watch sports while he's playing playstation. Nothing like a little NBA while playing a little Madden (admit it you all know the names of those silly games too). At first I thought this was such a waste and so silly and then I was like what do I care - all the better if they can all be hidden away in the basement while I have some quiet time to myself upstairs. However, the ugliness and the mismatching did bother me. I thought the industrial look would be perfect for our masculine basement setup. I kept searching the craigslist and the web but nothing or at least nothing in my budget. I loved this one from Restoration Hardware but it's $1100 and I needed 2. Or how about this one from Pottery Barn - lovely but again a little pricey. Then, one morning, I happened to be at Menards (a local home improvement store) and was cruising along and suddenly I saw it. Our pocketbook friendly media solution was staring right at me in their shelving display aisle. So after a little paint and a little stain and a little creative rearranging we now have 2 new industrial style media centers. Ta da. 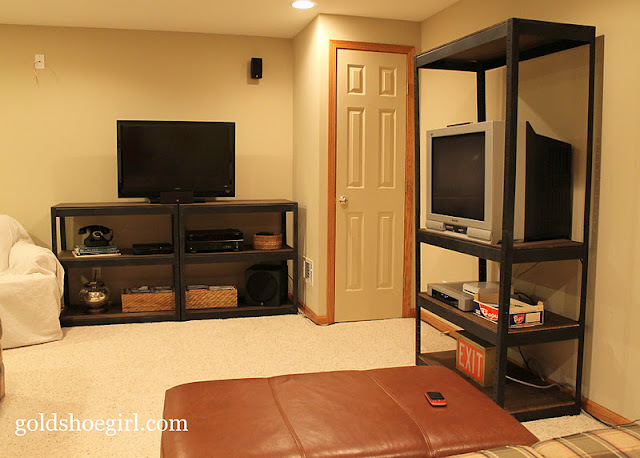 This is a picture of the wide media center which is really two separate shelving units placed next to each other. This is the tall one. I accessorized with things from around the house. I used an old orange crate to hold all the video game controllers and the exit sign was a thift store find from college. Eventually I want to add some items that have more color. I used 2 cd baskets to hold all the video games and the books are all sports themed. Here's one last view from the other couch. I have been searching for some art for the walls but I don't want anything that screams "mancave". Any suggestions? I'm really happy with the way they turned out. I think they not only mimic the pricier versions but I did it myself without needing a welder and saved a lot of money compared to the brand name versions. Tomorrow I'll share all the how to details - but really it was super easy. You are just gonna love this post. I know I loved making this project. You just gotta love an easy and cheap pillow project. Hee hee hee. I just love making myself giggle. You are probably just thinking I am a big dork but that is okay. If you have been following me on Pinterest you know I have a board dedicated to pillows. For some reason I really like pillows. I think it is because I know they are so easy to make that I have hopes that in between kid stuff, house projects, and life I will actually sit down and make some. Well, this weekend I did. I had never done an applique before and it was really easy and turned out so well I am going to share it with you. Now this technique can be used on any piece of fabric that you want to decorate. Most often I have seen it done on pillows and clothing but you could use it to make wall art or to jazz up a plain backpack or whatever. Step One: Cut out your pillow pieces. To do this you need to decide on size of pillow. I went on pb.com, looked at some of my faves, and just used one of their popular sizes - 16" x 26". You also need to decide if you are making a pillow cover or a stuffed pillow with a closed side. I decided to make a stuffed pillow so I only needed to cut 2 pieces of fabric in my desired size adding a 1/2" on each side for a seam allowance. 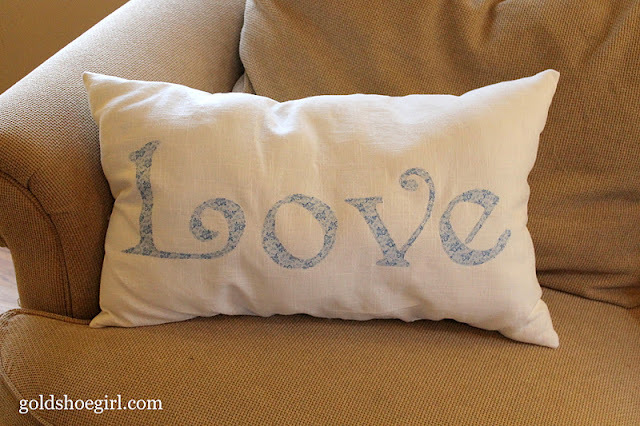 I am not going to go into the nitty gritty of sewing together a pillow as there are numerous tutorials on the web but if you have any questions please feel free to leave a comment. Step Two: Choose a design for the front of your pillow. This can be endless. You could do a word or a shape or both. Keep in mind if you (like me) don't have a fancy schmany Silhouette or Cricut machine that you will have to cut out your design by hand. It may be difficult to get a nice sharp result if you pick a design with many intricate or tiny cuts. 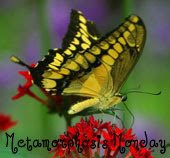 Once you decide on your design you need to make a stencil or pattern. For mine I just used Word and played around with different fonts and font sizes until I ended up with a look I liked. I used a font called Penshurst at 600 for my letters. 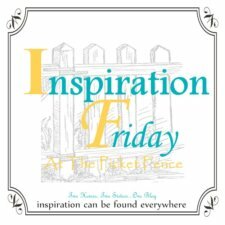 If you are looking for some neat fonts check out Emily's blog. She has collected some really great fonts together in one spot. HINT: If you use Word set it to print in just an outline form so that you don't waste a lot of printer ink. Step Three: Cut out matching pieces of fabric and iron-on adhesive. 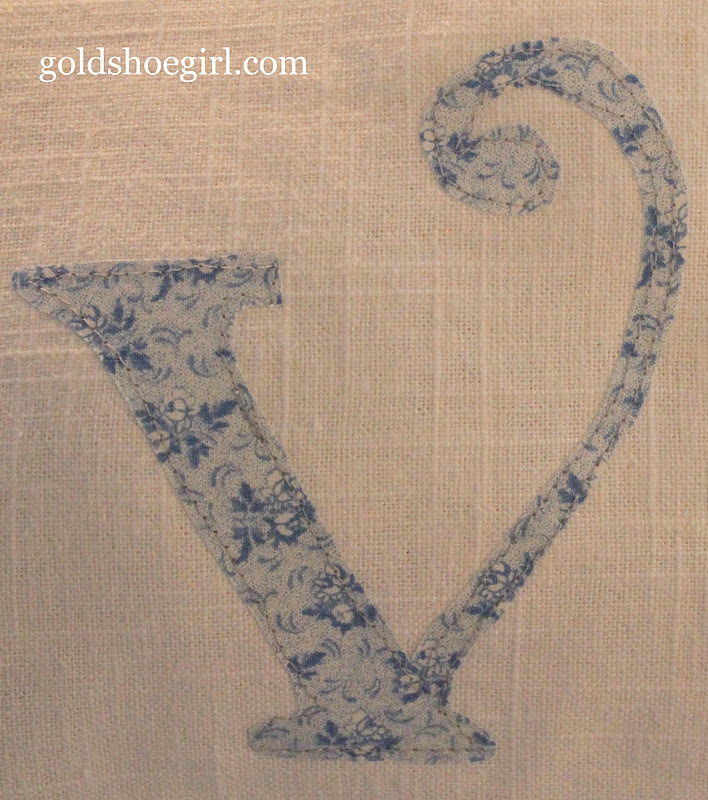 Using your stencil decide how much fabric you will need to apply the iron-on adhesive to. I just eyeballed this part. 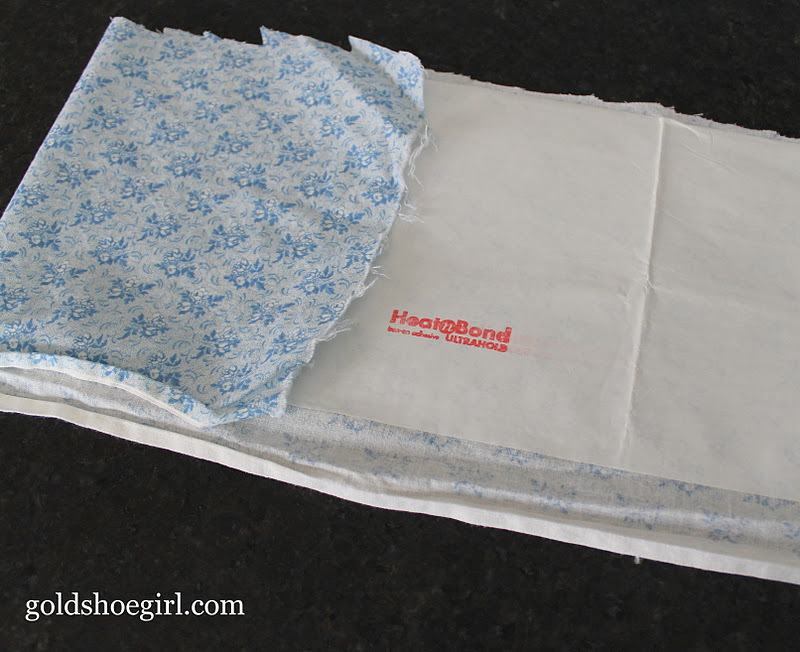 Step Four: Follow the package directions and adhere the iron-on adhesive to the wrong side or back side of your fabric. I used Heat-n-Bond and there is a plastic-feeling side and a paper side. You start by putting the plastic side down on the wrong side of the fabric. You can see in the picture below that the paper side of the iron-on adhesive is up so the adhesive side can be adhered to the wrong side of the fabric. I folded the fabric over so you see the right side versus the wrong side. Step Five: Trace your stencil onto the iron-on paper backing. Now remember the paper is on the wrong side of the fabric so you have to place your stencil so that when you cut out the fabric your design will read the right way. So for my letters it meant I had to put the backwards. So to be able to see the stencil I outlined it on the front of the printer paper with a thick black sharpie. 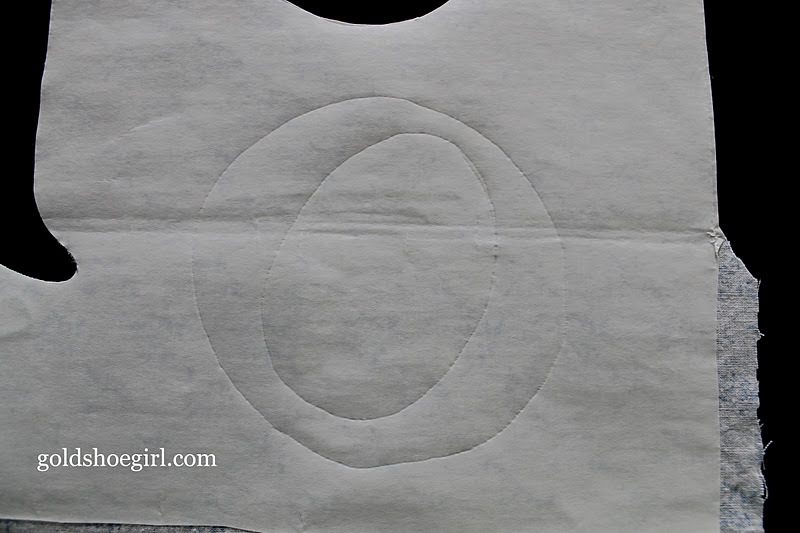 Once I placed it on the fabric I traced it with a ball-point pen with firm pressure. This gave me an outline on the iron-on paper to cut around. 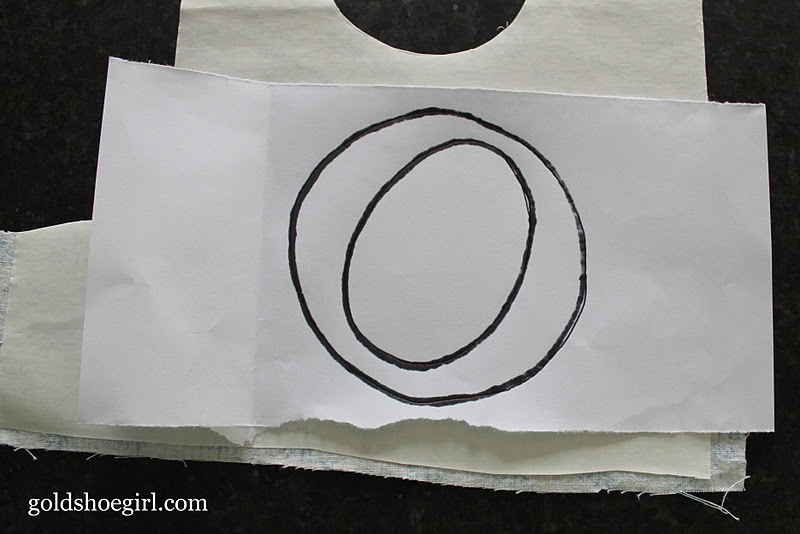 Step Six: Cut out your design and remove the paper backing from the fabric pieces. The picture shows the paper backing on the left and the back of the letter on the right. Step Seven: Arrange your design on the front piece of your pillow fabric. You may want to pin the design in place until right before you iron it. Step Eight: Iron-on your design following the package instructions. The picture shows one of the letters right after if has been ironed on to the pillow front. Step Nine: If desired add any extra embellishments to the front of your pillow now. 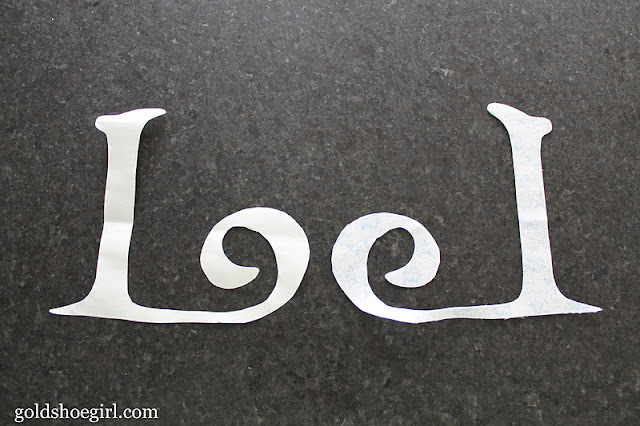 I decided to outline my letters with a subtle top stitch using my sewing machine. 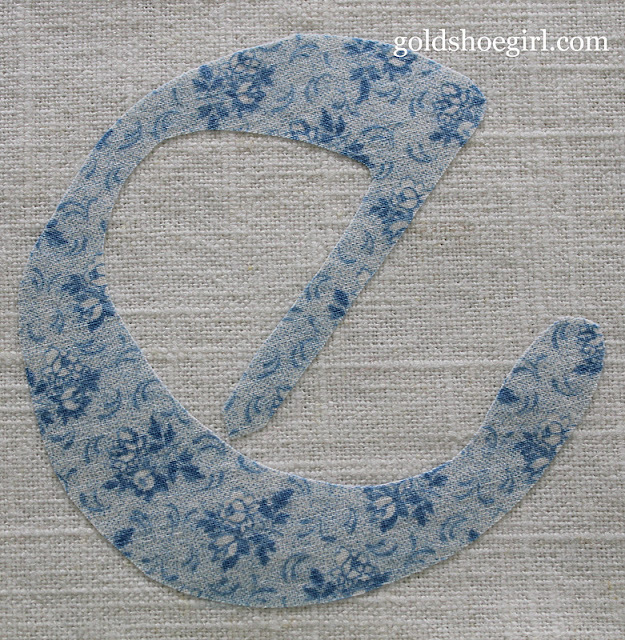 You could do a zig-zag stitch or hand-stitch around the letters. The possibilities are endless. Step Ten: Complete your pillow. Sew right sides together leaving a small opening for stuffing. Turn pillow right side out, add stuffing, and then slip stitch close the opening. All done. I will say that in the future I will probably not make a pillow this size. It is really big although it will probably live on our bed so it won't seem as large against the bed pillows as against the couch pillows. This cost not a penny because I already had everything on hand. Gotta love that. However, I did purchase these materials at one time so I will estimate the total cost at less than $10. Way better than the $49 for some of the Pottery Barn versions. 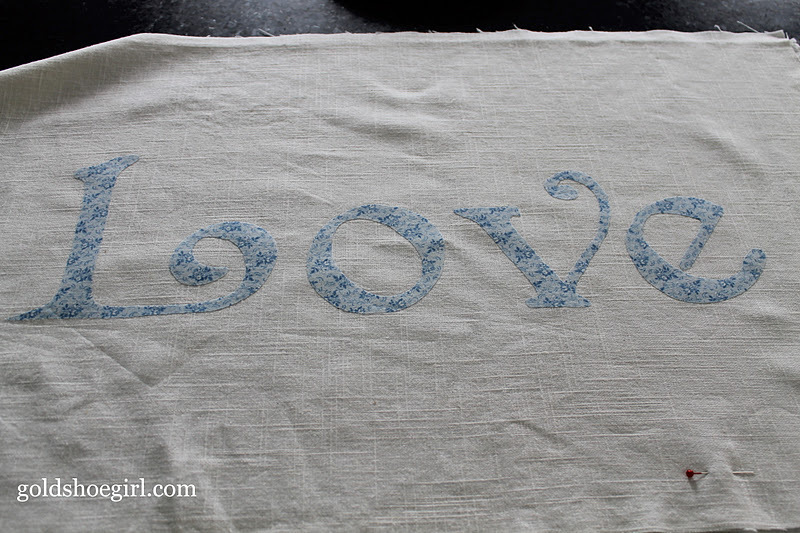 I used less than a yard of white linen-like cotton fabric for the pillow cover and probably about 1/4 yard each of a cotton print fabric and iron -on adhesive for the letters. I did use a whole bag of polyfil to stuff the pillow. 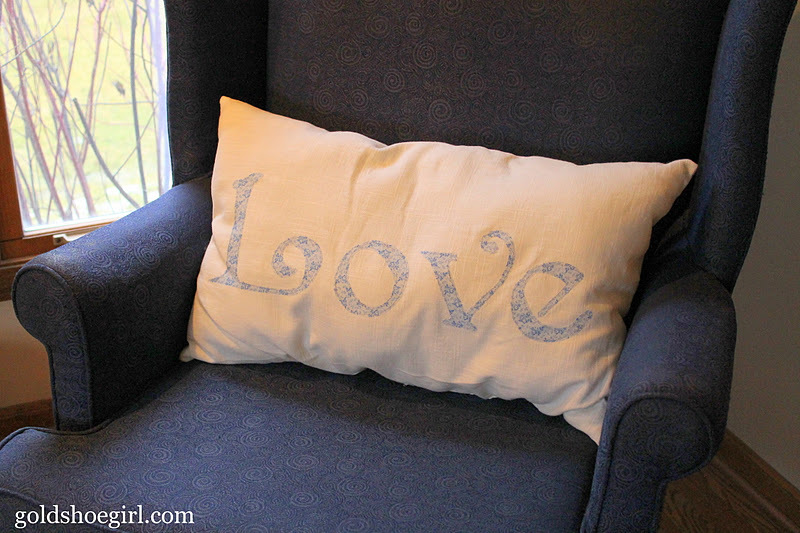 I had been wanting to make something lovely for Valentines, and this pillow was perfect in that I can continue to use it all year round while paying homage to this sweet time of year. What do you think? Does anyone else have any good Valentines ideas? If you enjoyed this post don't miss the next one. Click to Subscribe to Gold Shoe Girl by Email. ...to miss a room? More specifically a bathroom? I hope not because I am missing my old upstairs bathroom something fierce. You'll have to excuse the grainy photos. I took these in a rush with my old camera trying to capture the house before the movers came. I don't have any before pictures but imagine the same room with white walls, crappy linoleum flooring and a bank of kitchen cabinets where the tub is now. I loved this huge old window with its nice chunky moulding. It looked out onto our backyard and let in tons of natural light. When we bought our previous home we knew we would be putting in a new upstairs bathroom because at some point in time the upstairs had been converted into an apartment. In order to accommodate everything they had placed a makeshift bathroom in the hallway - it actually had a door on each end so you could get to the rooms on either side. 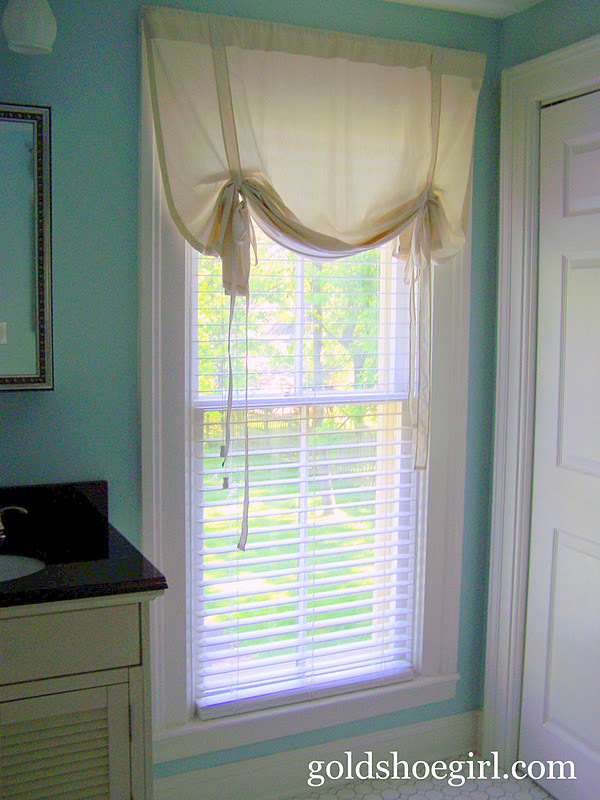 One of the bedrooms had also been converted into a kitchen/laundry room. It took about 3 years before we had the time and money to start the project but it turned out wonderfully. We interviewed 3 contractors and choose a local one-man operation. He was really, really slow but he had great suggestions and was okay with us buying our items ourselves. Some contractors want you to use an allowance system buying from their suppliers. This has never worked out well for us - I just don't think you get your money's worth and you don't always get the selection you want. Anyways the project entailed gutting the existing bathroom in the hallway, restoring the hallway to a hallway and turning the makeshift kitchen into a bathroom with a laundry closet. It took 2+ months and I did all the painting myself. Our upstairs was a disaster of dust, dirt, paint, equipment, tools, etc. Plus I was making weekly trips to the local laundromat. In the end it was all worth it. I loved that bathroom. 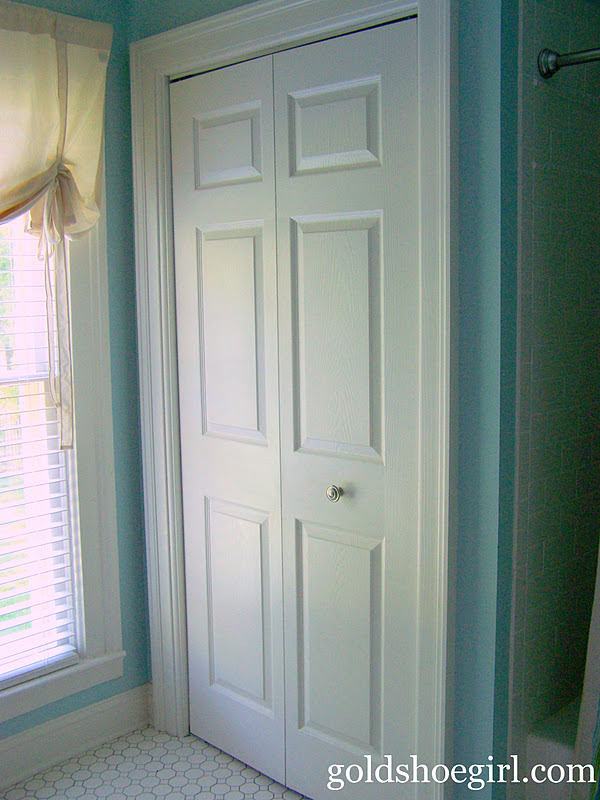 It was the perfect aqua blue color framed by the white moulding and all the little details came together perfectly. 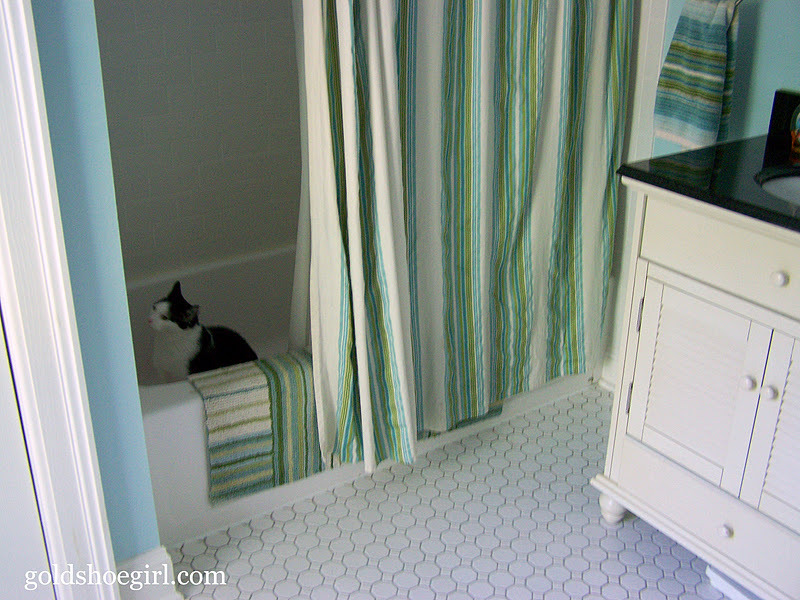 I chose the striped shower curtain and towels from Target to keep the room from getting too girly for my husband. That's our cat in the tub. He suddenly started only drinking water from the tub faucet - strange. More importantly notice the awesome hexagon and dot floor tile. So simple and beautiful. I cannot stress how great it was to have a 2nd floor laundry. Best. Thing. Ever. Now my laundry is in the basement. Hauling laundry for 5 people up and down 2 flights of stairs is not my idea of fun. It's like there is laundry everywhere. So much nicer to be able to gather it up and keep it all on the same level. 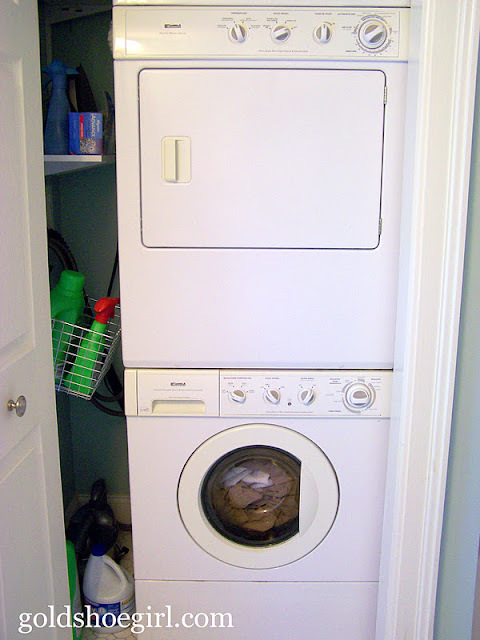 This picture shows the laundry closet closed and in the one below that you can see the stacked washer & dryer. I had a cute little wire mesh basket hanging from an antique hook that kept all my detergent handy. 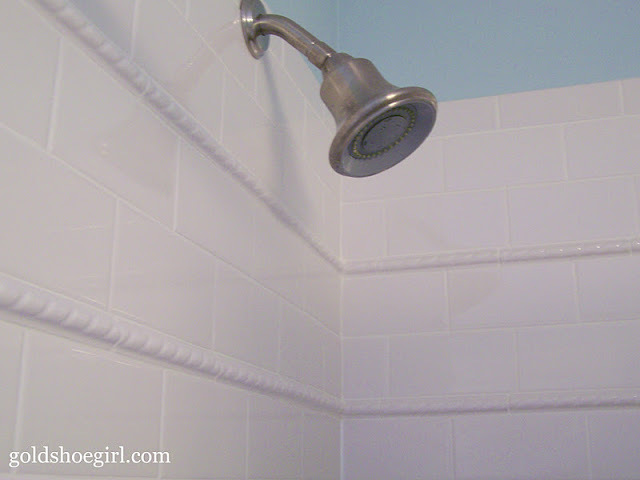 We choose a simple white subway tile for the tub surround. I did that just to make sure that if I ever wanted to change the paint color or the accessories I could with ease. I bought stock tile from Home Depot so this was a budget friendly part of the renovation. All the shower and sink fixtures were from Delta in a satin nickel finish. I was able to get the light fixtures and towel bars from the same collection so everything matched nicely. 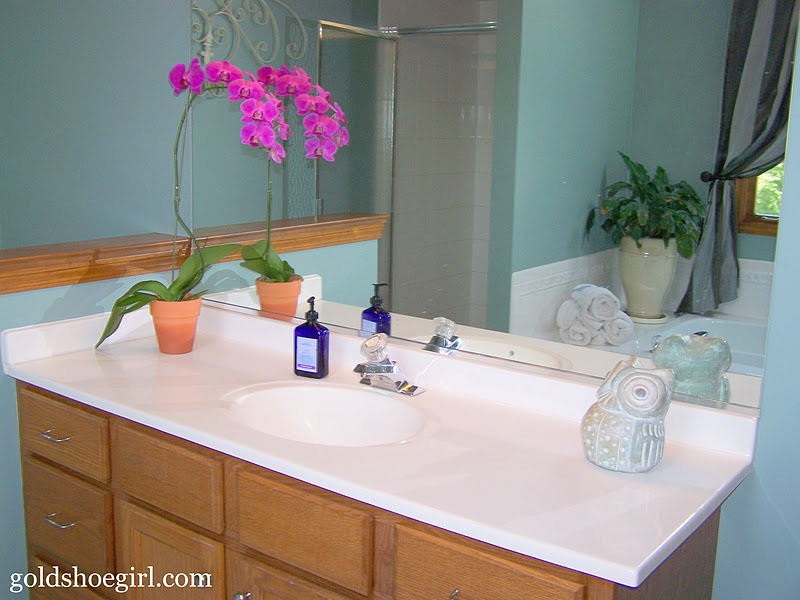 One of my must haves was 2 sinks. Because this was a very old house we only had one upstairs bath so I needed to have a sink for the kids and a sink for me. 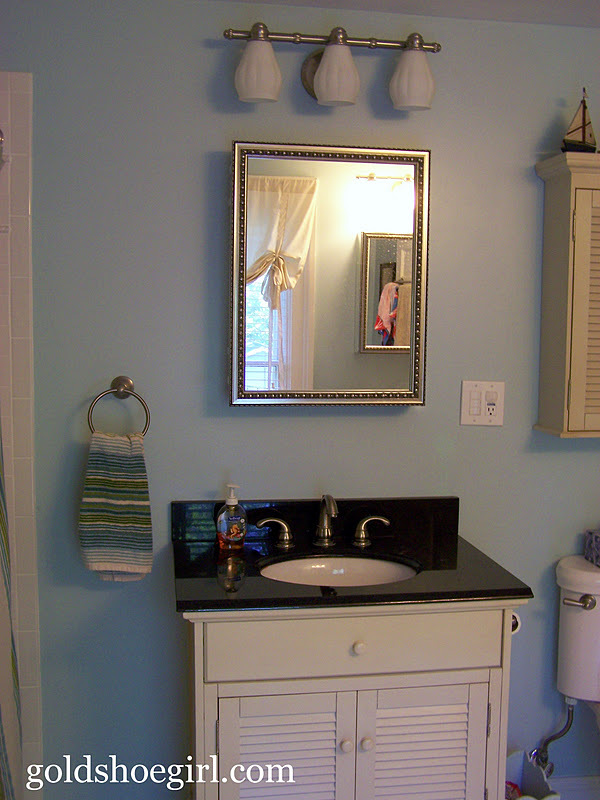 With some of the plumbing limitations we ended up having 2 vanities - one next to the toilet and one next to the window - which worked out great. It actually kept the kid mess contained to their vanity while mine could stay clean:). The vanities and the cabinet above the toilet were a special order from Home Depot. The medicine cabinets were Kohler from Lowes. I really liked them because they were mirrored on the sides too which threw some extra light around and they had a neat egg and dart detail around the frame. They were a little more than I had planned to spend but it was worth it because they looked so good. So...our new house is nice in that we have our own separate master bath but it is not close to being as lovely as my old one. I shouldn't complain but builder's grade oak cabinets and big huge standard mirror just don't make my heart go pitter patter. If you follow me on Pinterest you can see all my dream pictures for when the time comes to update our current master bath. Until then I will just keep pining away for the old one. Can you blame me? 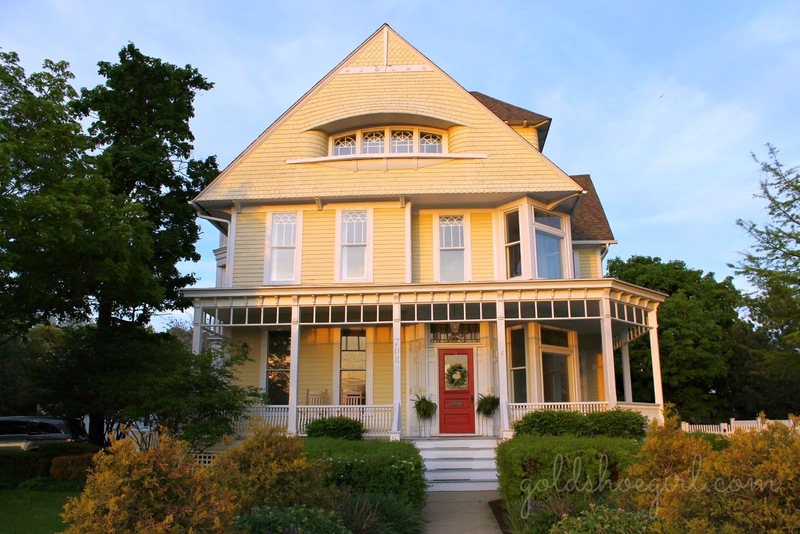 Does anyone else have a room they miss from a previous house? Living in New York City, I’m always on the lookout for storage solutions, whether it’s a pretty container to store stuff that has to be visible or a smarter way of organizing the stuff itself. 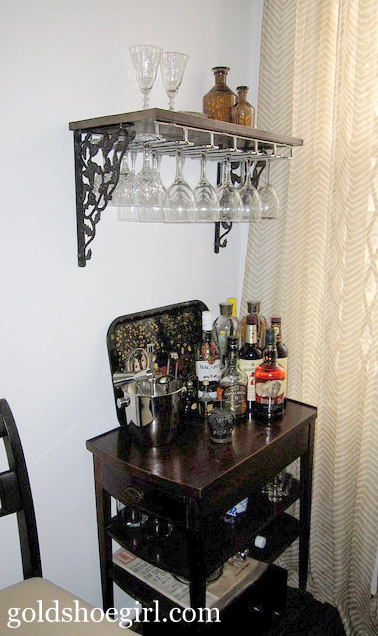 About 2 years ago, I bought an end table that I re-appropriated as a small bar cart to relieve my overflowing kitchen cabinets of glassware and my small collection of liquor. This worked well until my husband moved in with his collection of glassware and larger collection of liquor. Pretty soon we were back to same problem only this time with an overcrowded tabletop in the corner of my living room plus overflowing kitchen cabinets. Enter the Pottery Barn catalog, the source of decorating inspirations and aspirations. Inspirations because it does have so many lovely things and aspirations because everything costs an arm and a leg. However, it did have a really nice looking wine glass shelf- dark wood shelf with a cast iron rack for the glasses underneath. It was a great solution but I didn’t want to pay $80 for it. Unfortunately it never went on sale and when I finally had a discount code, the one I wanted was out of stock. At that point, I decided to just make the damn shelf myself and given what an easy project it turned out to be, I wish I had done it sooner. Plus the whole thing cost just over $30. 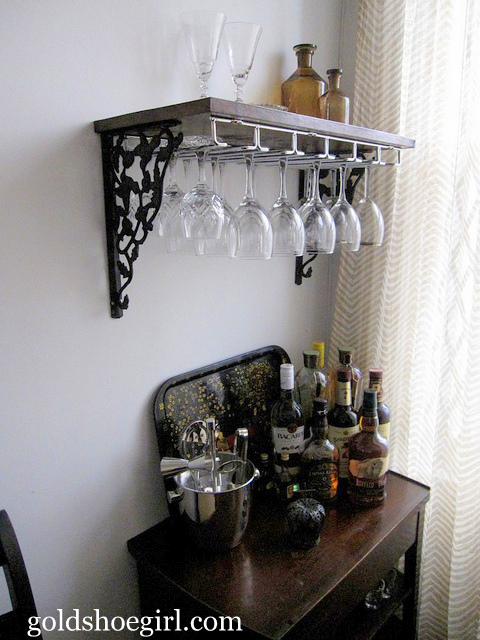 We bought some pretty cast iron brackets at an antique store (about $8 each), got a salvaged piece of wood from my father’s basement (free), and ordered the under the counter wine glasses rack from Amazon ($15). 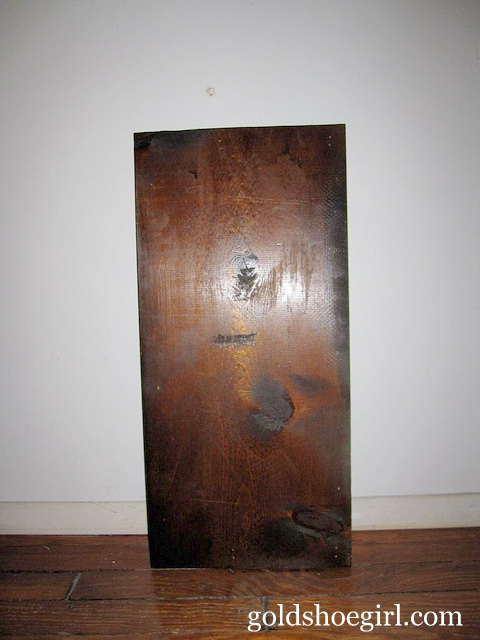 The wood happened to be leftover from an old bookcase so it was already stained. We just cut it to fit and used a little stain I already had to finish the ends. Here you can see the hummingbird design in the brackets. This project is essentially the same as putting up a regular shelf- it doesn’t get much more basic. 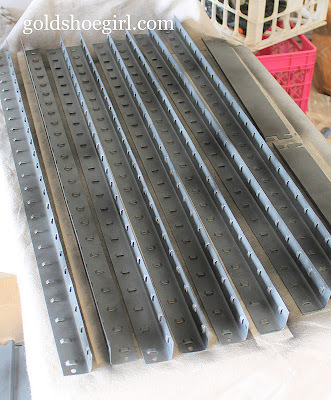 The most important thing is to accurately measure to make sure the rack and the brackets fit on the shelf bottom and that you have lined up the holes for the brackets correctly on the wall. 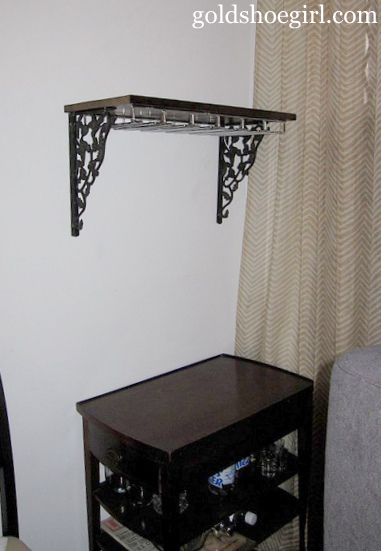 This is especially true if you go with antique brackets since the holes tend to irregular and the bracket itself didn’t lie flush to the wall or the shelf. 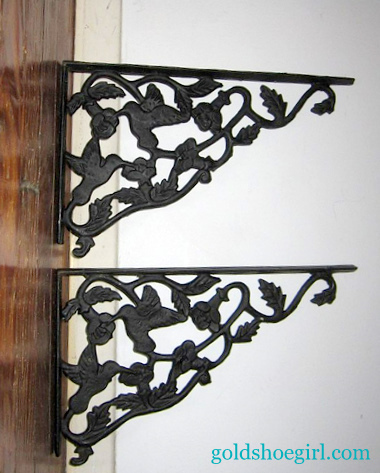 Obviously, if you use heavy brackets like cast iron, get some serious anchors for the wall. The last thing you want is the shelf to fall out of the wall with all those glasses attached. 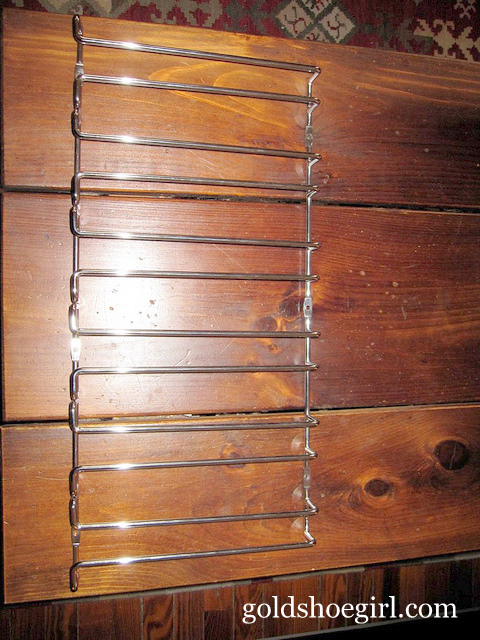 The rack before being attached to the shelf. I would also add the advice to get your glass rack and brackets before you buy or cut the wood for your shelf, especially if you order anything online. I say this because the rack we ordered from Amazon did not have the same dimensions as the product descriptions on the website which meant that the shelf we had originally bought was not deep enough. Even though the depth of the rack was only off by a 1/4th of an inch, it was enough to make the shelf unusable. There are some good solutions to this dilemma which include adding a piece of molding to the front or back of the shelf but we had bought a pre-finished shelf from Home Depot so those weren’t going to blend well. Whatever shelf option you go with, just get your rack and brackets first and then you can either cut your wood to fit or get the right sized shelf. Beyond the measuring and the anchors, everything else is really a matter of aesthetics for the bracket style, finish of the wood, size of the rack, etc. 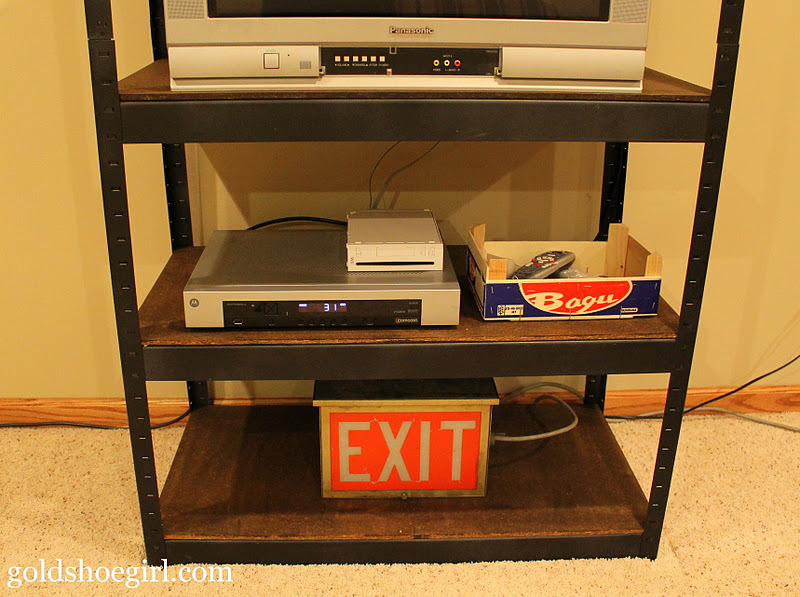 You could pretty easily paint the rack black to match the brackets, turn the brackets the other way, or add molding to the edges for a fancier look. Installing the assembled rack on the wall. We’re really pleased with how it turned out and how much more storage it gave us. An easy project that was done in one afternoon for less than half the cost of the store bought version! Attached to the wall - waiting for the glasses. All decked out - looking great!